IMPORTANT NOTE: Ordering captions through your Vimeo account is restricted to PRO or PLUS accounts. 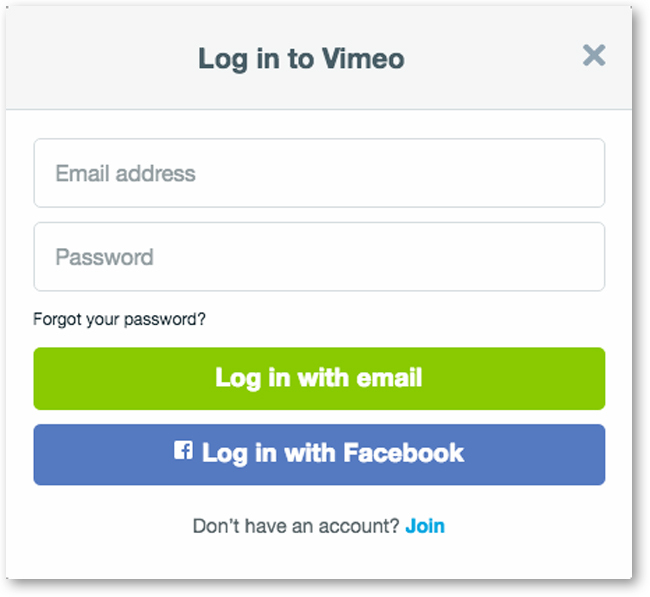 If you are using a Basic Vimeo account, you should follow this support article to get your Vimeo videos captioned. Once the Vimeo integration is set up, follow the steps below to submit a closed captioning request. Upon completion of the transcription process the closed captions will automatically be added to the associated Vimeo content. Create albums in your Vimeo account, to be able to request all of the turnaround time service levels offered by 3Play Media (standard, expedited, rush, same day, two hour, and extended), an album will need to be created for each service level in addition to an album called 3play_processed. Click your user profile icon located in the upper, right-hand corner of the page and from the drop-down menu that appears click Collections. 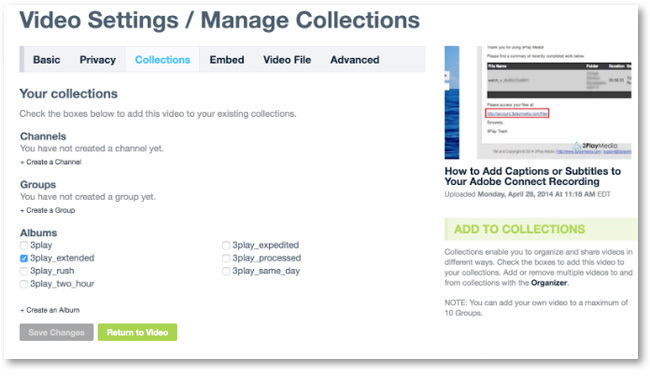 With the Vimeo integration, choosing a turnaround time for the closed captioning request is done by adding the video to an album that corresponds to a 3Play Media turnaround service level. From the Collections page click +Create new album. Name this album 3play_processed then click Create New Album. While the 3play_processed album does not correspond to a turnaround service level this album MUST be created in order for the integration to work. NOTE: Only PRO or PLUS Vimeo accounts will be able to create the 7 albums necessary to take full advantage of the Vimeo integration. Basic users won’t see auto-upload in linked account settings. 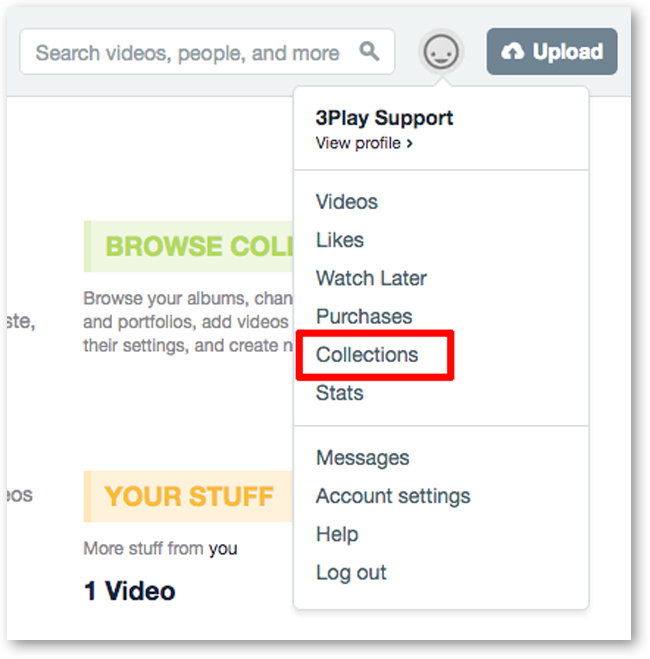 Navigate to the video you need captioned, and click Collections. Next check the box of the turnaround level you want, then click Save Changes. Once a video has been uploaded to your Vimeo account, you can move the video to the appropriate album, to designate the file's turnaround time. For example, if you need a file for Rush turnaround, add the video to the album 3play_rush. Your video will then be added to the 3play_processed album, once the video has successfully ordered captions.